You know how I’ve been talking about whipping my outdoor spaces into shape? Actually, I think I’ve been talking about it… if not, I’ve been talking to myself about it quite often haha. 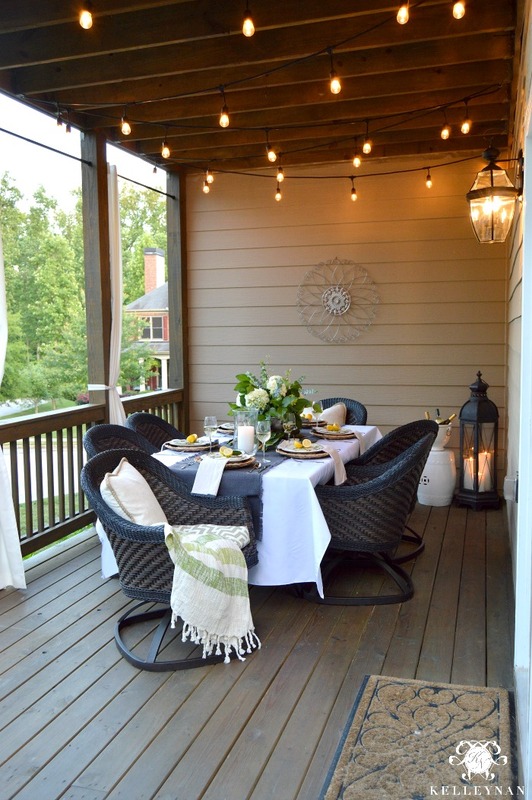 This past Saturday was marked by a long awaited porch makeover and a relaxing date night on the deck. Made up of a covered porch and open deck area, we finally tackled the main outdoor living space (and saw Beauty and the Beast 😉 ). I’ll be sharing the latter next week (the open deck part – not the Beauty and the Beast part haha), but to give you an idea of the project, here’s what had to happen. 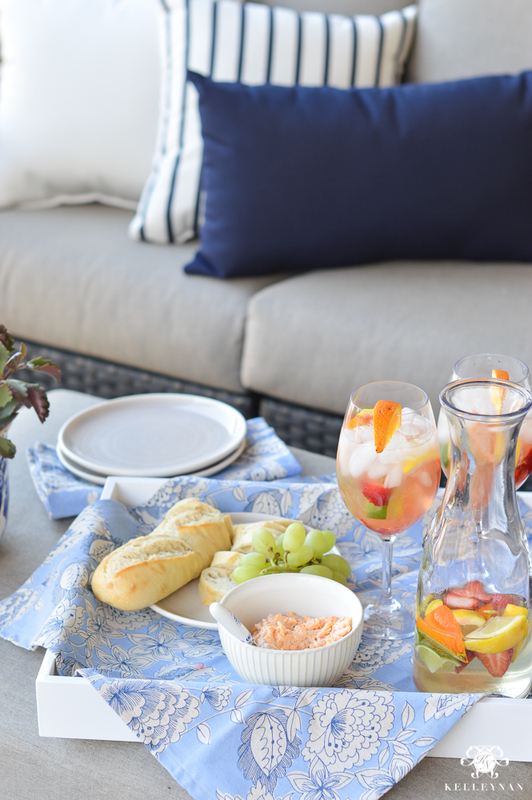 Last summer, we had a dining table under the covered porch and lounge chairs on the open deck. 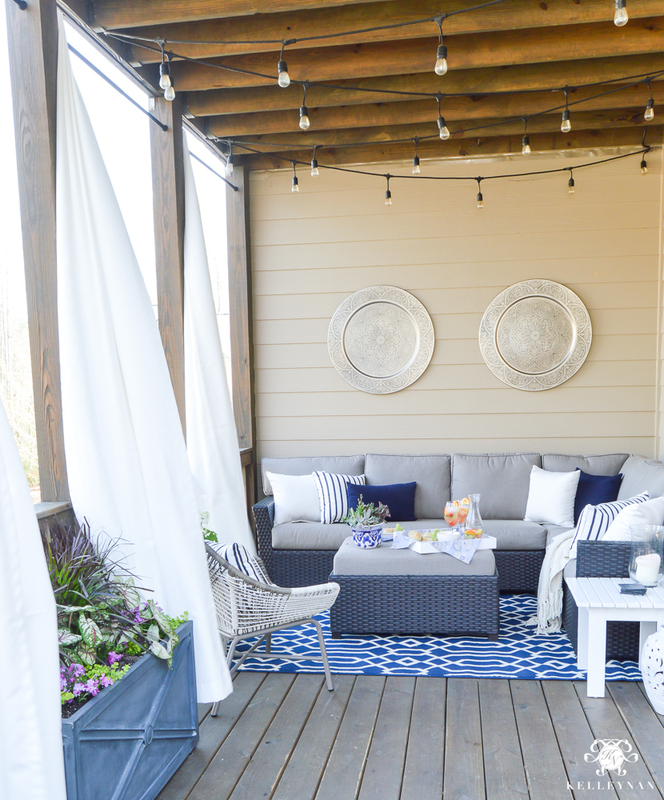 I have wanted to traded in the loungers for a sectional-style seating area for a while and it seemed with the (possibly) harsh elements of the Georgia summers, a sectional would need to go under the covered porch to extend its lifespan. We purchased one a couple months ago, ditched the loungers, and moved the table. It was super bare- a few basic pieces with no defined space between the two sections. 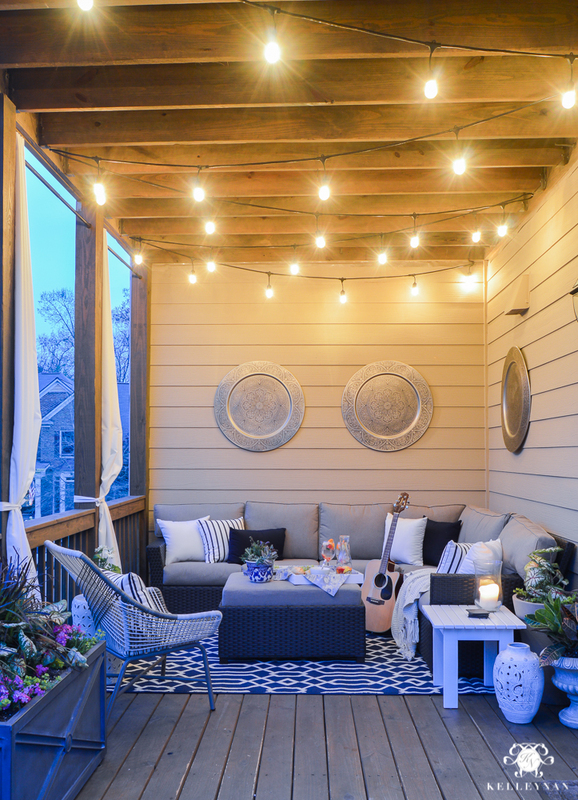 I don’t have a true “before” to show how desperate this space was but I did manage to pull an image from last year’s Bloggers’ Progressive Dinner to give you an idea of the covered porch layout. This is when it was dressed its absolute best ;). While I won’t deny, this space was used a ton, it was cramped, and wasted the other half of the deck. For the last couple of months, I have been anticipating when I would be able to finish the spaces. 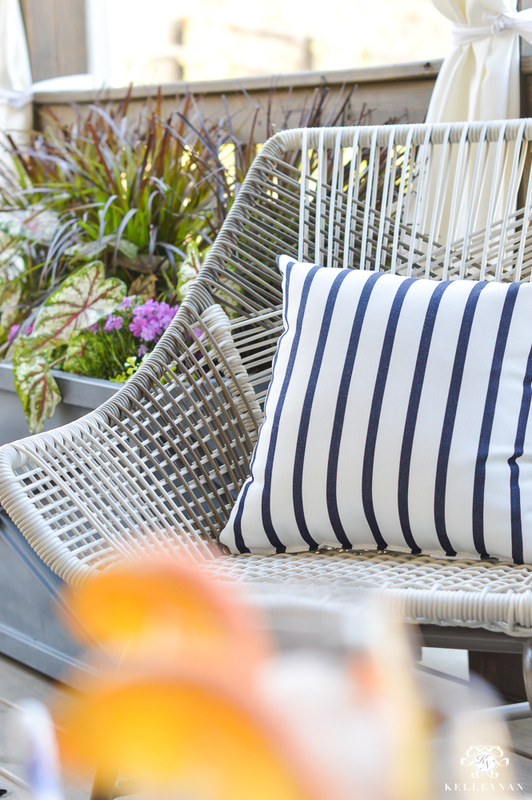 I routinely start spring with World Market as the first place I seek inspiration and source outdoor decor – a practice I learned from my mom years ago. 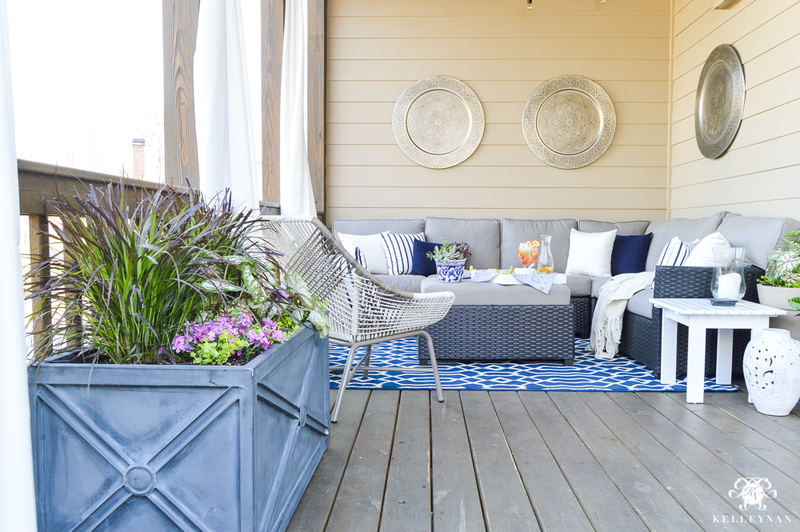 Her outdoor spaces are more vibrant but World Market has always been able to accommodate both of our styles, and super affordably. This year, I partnered with them and within an hour of browsing, searching, and loading my virtual cart, I had assembled my porch. We had an interesting pollen experience, a misbehaving blower, a wet-dry vac that saved the day, and an entire afternoon of planting and assembling the space. The result – I could (and literally, may) sleep out here. Note: All sources are linked and listed at the bottom of this post. Post contains some affiliate links. 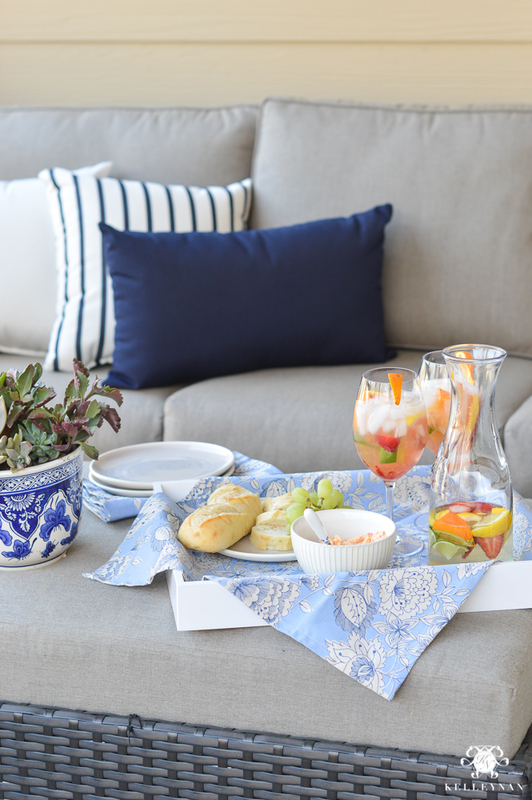 I wanted to stay true to myself, which doesn’t involve a ton of bright colors, so similarly to my spring home tour (HERE), I decided on blue and white to compliment my neutral pieces. When I was placing my order, I can’t even remember which came first – the wall medallions? The chair? The rug? The pillows? Speaking of pillows, I had no idea that World Market carried Sunbrella pillows. Like my furniture cushions, I always look for Sunbrella when I can for fade resistance and quality. After standing on the porch railing to hang curtains for too long (my job), planting, hanging art, and cleaning, we took advantage of our little nook right then. When I say we “live” out here during warm weather season, we really live out here. We don’t have a mounted TV but Dave did get one specifically for this space, that lives in a closet when its not in use. 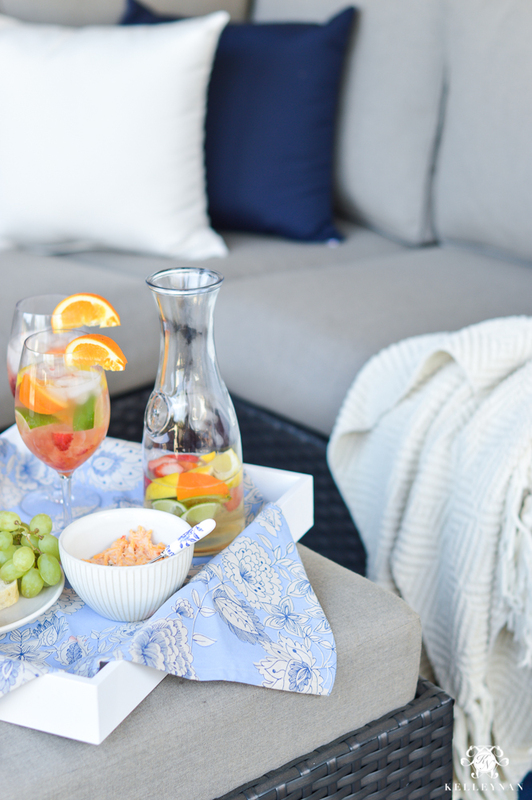 Outdoor dinner and movie date nights at home are our absolute favorite. 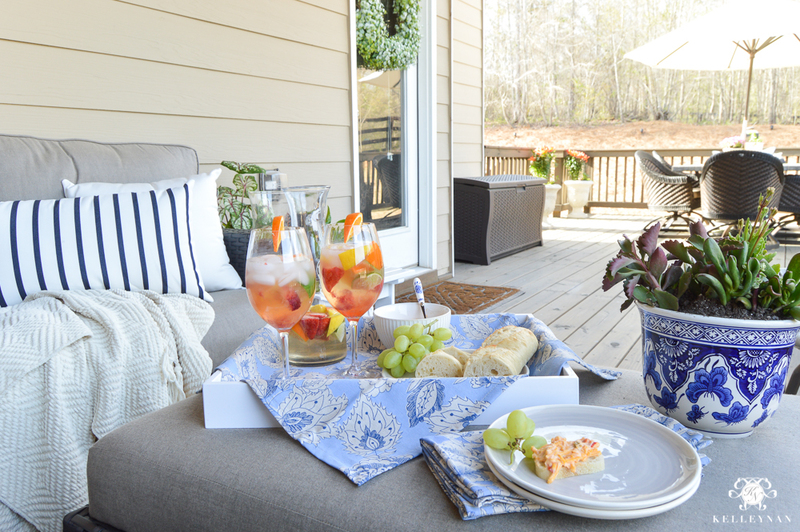 My deck entertaining essentials are 1. a good selection of trays (pictured); and 2. acrylic drinkware. I love these bordeaux glasses because they don’t look plastic. My fridge and pantry essentials – jalepeño Palmetto Cheese, fruit, and bread/crackers. 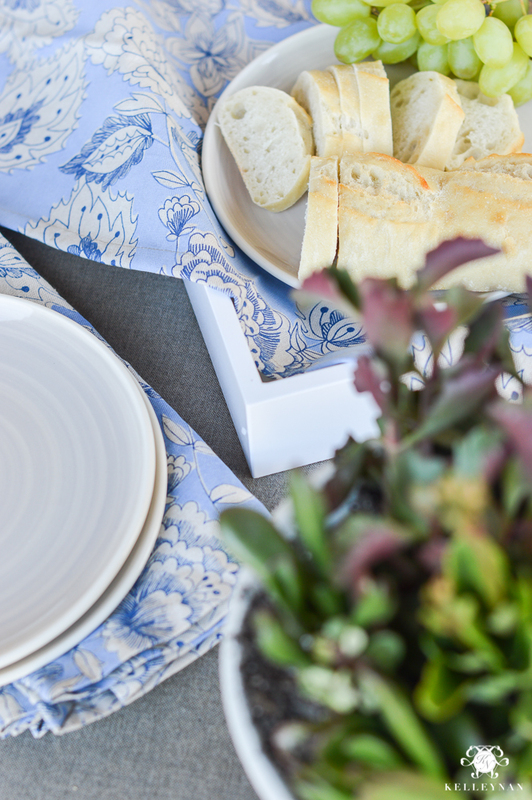 With these, you will always be ready to feed guests who stop by and have a light, summer meal. 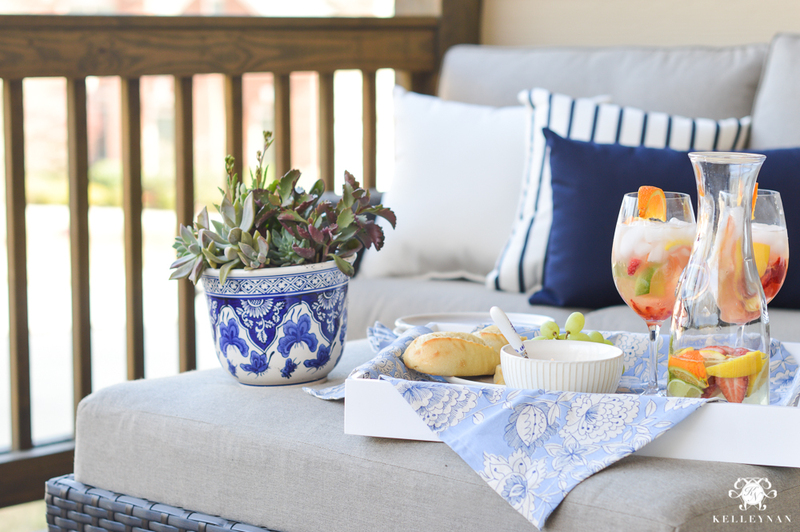 For our dates on the porch, I love using a tray as a tabletop and keeping it simple without the fuss. Cleanup at the end of the night is so much easier, having a “tabletop” that can be carried inside. I’ll be hoping to fit in another date night just like this, this coming weekend. 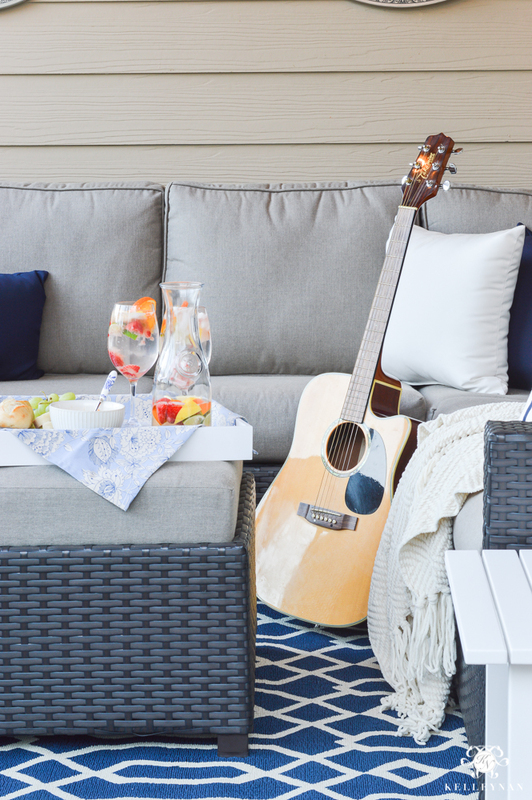 What are your outdoor living essentials? Next week, I’ll be sharing the other side of this space and the following week, I’ll be sharing the never-before-seen screened porch off of our bedroom. LOVE how your space looks Kelley! I’m especially smitten by that sectional and chair – such great pieces. I think I’d be living in this space 24/7 this spring! Kris, thank you! We are so happy to be spring-ready! Where did you get the sectional? Oh Kelley this turned out so good, I really like how cozy it is,a great place for cocktails with friends. beautiful and cozy!! Wonderful job. I cannot wait to get back home and get started on mine! Marion, thank you!! 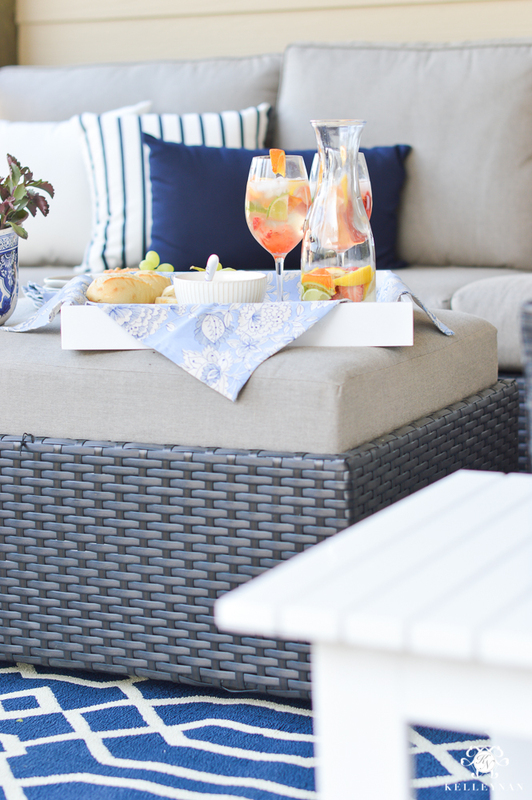 Aren’t outdoor spaces so fun to decorate?? Kelley, this looks so beautiful and inviting. All your hard work paid off big time! Seeing your deck takes me back to my Georgia days, but I sure as heck don’t miss that pollen, lol!!! Fantastic job, and Happy Spring to you! Kelly, this looks beautiful! So glad you embraced the blue and white outside and know you guys will be spending all of your time out here (when you can)! I’m sure the fur kids will make themselves at home here as well if they haven’t already! Love you! Susan, thank you!! EVERYONE should see your outdoor space- it is spectacular. 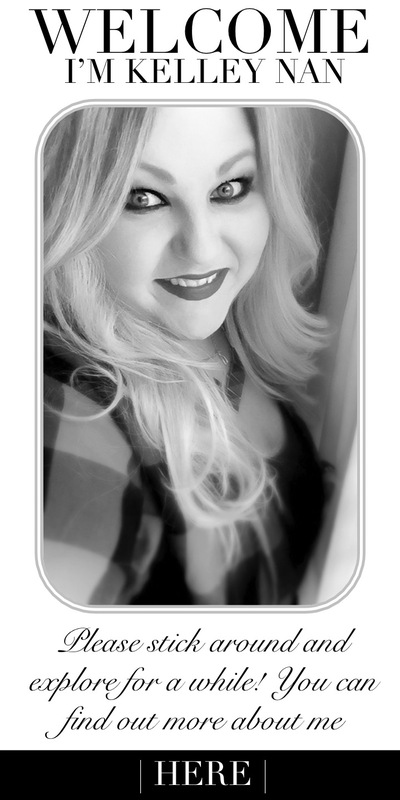 xoxo love you! Sarah, I giggled when I saw! But what a deal on sunbrella!! Thanks so much for sharing your beautiful and relaxing makeover space, Kelley! You’ve inspired me — again! Sharon, thank YOU for taking the time to stop by! 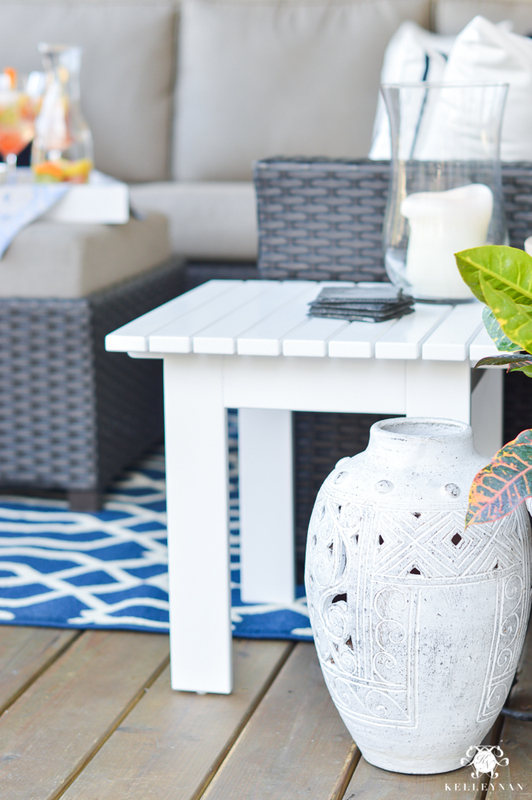 I hope you have so much fun prepping your outdoor space this year! 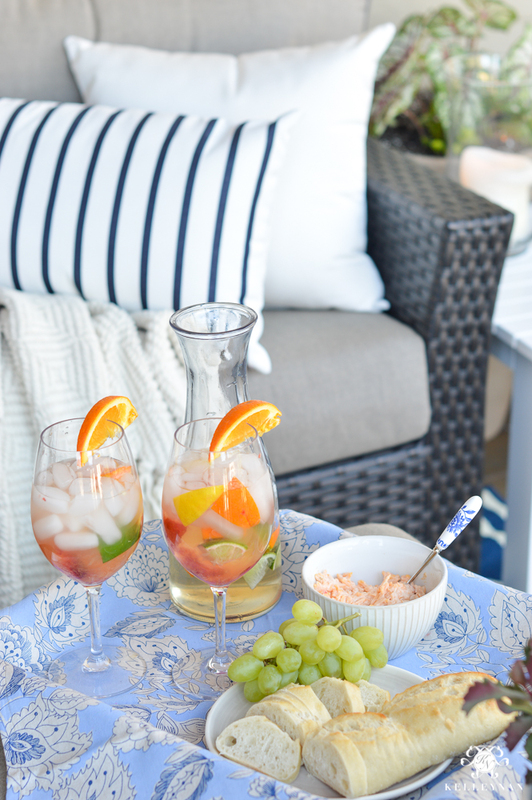 This looks fabulous and it’s getting me so excited to get our patio ready!! Now if the snow would just melt already! I especially love all the blues!! Gorgeous! I can’t believe you still have snow! So excited for you and your outdoor space; it will be magnificent! Bree, thank you so much! I didn’t know if the chair would be comfortable but it totally is- woo! Kelley, this space looks AWESOME! So inviting and festive, and I’ve been eyeing that woven chair! Fab! 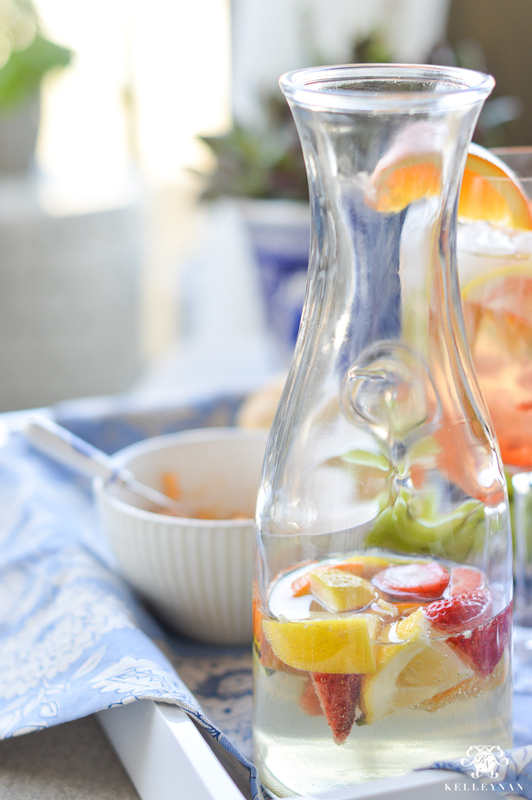 Gosh…This looks great! I can’t wait to see in person. I absolutely love every detail! Tammy, I need to post it! So many questions on that! Gorgeous Kelley! You’ve outdone yourself per usual! Can’t wait to see it in person and enjoy some wine in those comfy seats!! Becca, so excited for y’all to come hang with us out here!! Randi, thank you! Wanna talk about transformations? How bout that iconic kitchen!? I love shopping at World Market…They have it all…Love the blue and white, so cool and inviting…Wonderful lightening,, so romantic… Looks like a great place for entertaining..
Would you share your sangria recipe? Thanks! Melinda, I need to post it soon; I had a bunch of questions on that! This space looks amazing and so inviting! I may have missed this, but can you tell me where the sofa is from? I love the colors of it and the color of the cushions! Was this an instore find or online? I’ve been stalking our local Costco and their selection is awful compared to what I’m seeing others find! Hi, Kally! It was an in-store find a few months ago. They are funny about carrying stock of just a few things and then phasing them out. Keep watching! This looks fabulous Kel!!! You must want to sit out here 24/7! The woven chair is my dream chair and the new sectional looks so cozy and perfect for entertaining! Phenomenal job! Wow, I am in love. Very beautiful! This is such a beautiful makeover. Would you mind posting the brand of the sectional? I love this space . We’re did you get the single medallion on the first photo ( before the remodel ) ? It was also a Costco find two years ago! Kelley, I always turn to your posts for inspiration. You design the most beautiful spaces. I’m currently working on my back porch and was hoping you could share your back porch measurements with me. It looks like your area is like mine, which is a little more narrow but longer. Also, where did you get that outdoor dining table? I love it! Lauren, I don’t have measurements on hand – would have to check- but yes, it is more long than wide. The table was a Costco find a couple of years ago! where can i find these string lights??? i am in market for some and i like how bright yours are. Hannah, thank you! You can find a lot online BUT, my favorites are these which are COSTCO. They have them every year and a lot of times, they will run them for $10 off. I’m not sure if they still have them but if not, they will be back! Hi! Beautiful porch. Thanks for the inspiration =) Can you tell me the size of the rug you got? 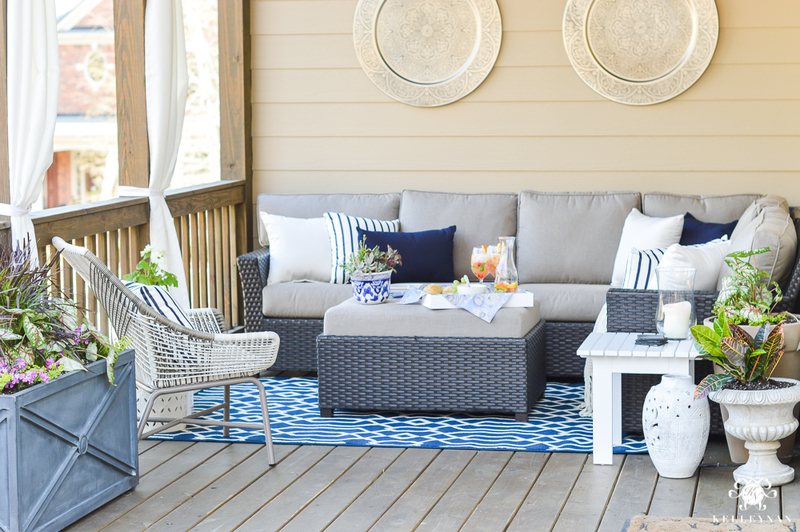 Love your style Kelleynan, we would love to see the deck, where did you get the deck furniture? thanks. 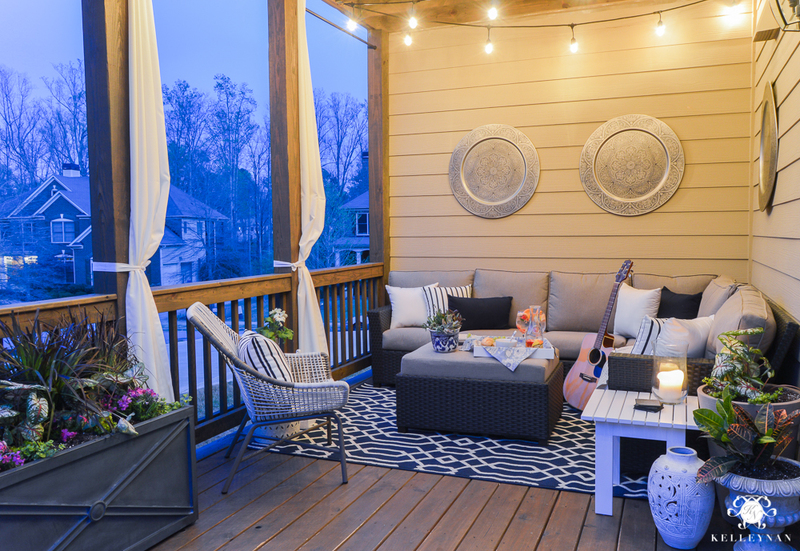 Love your porch design! How did you get your string of lights to hang on the ceiling? Did you use hooks or something else?